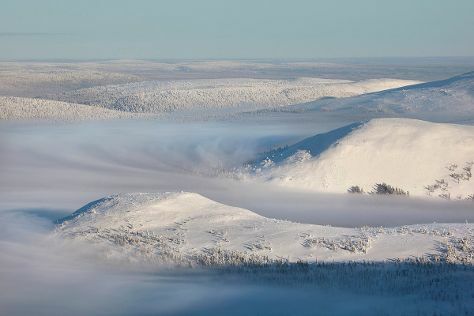 Get outdoors at Pallas-Yllastunturi National Park and Yllas Ski Resort. Explore hidden gems such as Giewont Husky Adventures and G2 Ice Karting Levi. 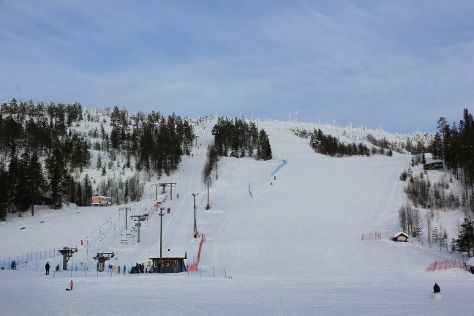 Explore the numerous day-trip ideas around Akaslompolo: Levi (Ice Karting Levi, Kid's Land, & more) and Snow Village (in Kittila). To see other places to visit, maps, and more tourist information, read Akaslompolo driving holiday site . Brussels, Belgium to Akaslompolo is an approximately 14.5-hour flight. You can also drive. The time zone difference when traveling from Brussels to Akaslompolo is 1 hour. Expect much colder temperatures when traveling from Brussels in December; daily highs in Akaslompolo reach -5°C and lows reach -15°C. Wrap up your sightseeing on the 23rd (Mon) to allow time to travel to Salla. Salla is a municipality of Finland, located in Lapland. Kick off your visit on the 24th (Tue): fly down the slopes at Salla Ski Resort, brush up on your military savvy at Salla Museum of War & Reconstruction, and then steep yourself in history at Paikanselan Taistelualue. For maps, photos, other places to visit, and other tourist information, go to the Salla travel itinerary planner. Traveling by car from Akaslompolo to Salla takes 4 hours. December in Salla sees daily highs of -7°C and lows of -16°C at night. Wrap up your sightseeing on the 24th (Tue) to allow time to travel to Saariselka. Kick off your visit on the 25th (Wed): fly down the slopes at Saariselka Ski & Sport Resort. On the 26th (Thu), you'll have a packed day of sightseeing: take in the architecture and atmosphere at Pielpajarvi Wilderness Church, then see the interesting displays at Siida, and then examine the collection at Gold Prospector Museum. To find traveler tips, ratings, more things to do, and other tourist information, go to the Saariselka trip maker . Traveling by car from Salla to Saariselka takes 3.5 hours. In December in Saariselka, expect temperatures between -7°C during the day and -17°C at night. You will leave for home on the 27th (Fri).